In these lessons, students will learn how to respond to the play not just as a piece of writing, but as a piece of drama. Tasks include: researching previous productions and adaptations to broaden their understanding of the text; a prompt book activity, asking students to imagine their own staging of Lady Macbeth's sleepwalking scene in Act 5, Scene 1; and a list of practice exam questions with an emphasis on the text in performance. These lesson plans are available in the Downloads section at the bottom of this page. To download resources, you must be logged in. Sign up to access this and other exclusive features. Activities mentioned in these resources are available in a separate downloadable 'Student Booklet', also at the bottom of this page. 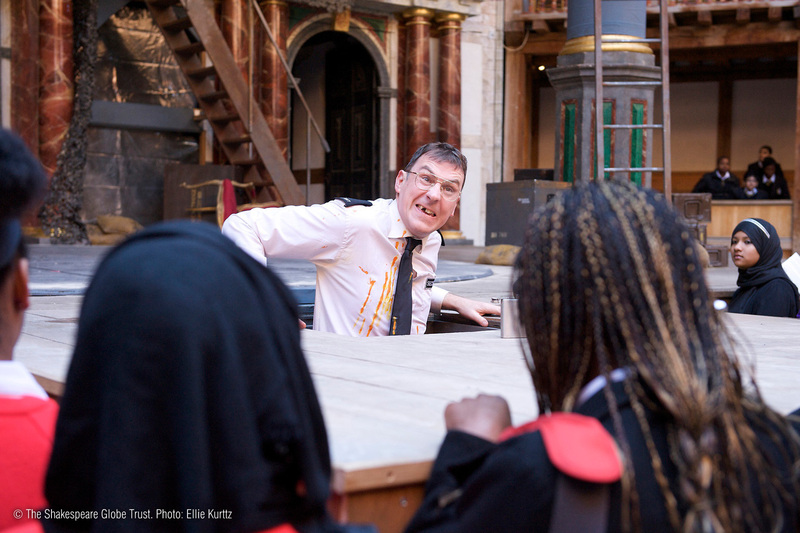 The 'Teachers' Guide' download explains how best to use Teach Shakespeare and also contains a bibliography and appendices referencing the resources used throughout. Can I ask questions to help me find out about the new Globe Theatre? Can I research in detail one way in which the Globe Theatre incorporates original theatre practices in its work? 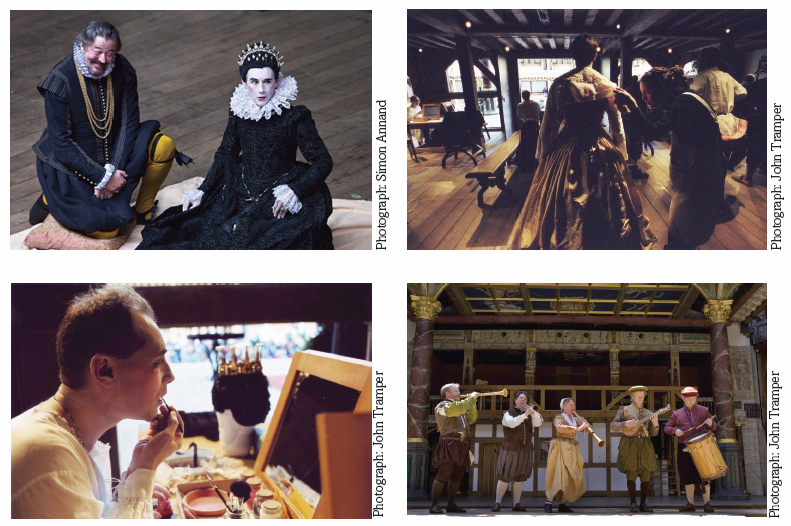 Students should look at the following four images which are included in the Student Booklet: Stephen Fry dressed as Malvolio, and Mark Rylance dressed as Olivia in the 2012 production of Twelfth Night; costumes being fitted backstage before a production of Twelfth Night in 2002; Mark Rylance applying make up backstage; musicians from the 2008 production of The Merry Wives of Windsor. Also show the following video, which is a speech from Richard II performed in Original Pronunciation by Ben Crystal. The connection is ‘original theatre practices’. Students could also be asked for their view on whether they feel the things that are pictured are relevant to modern theatre. This question should provoke and set up a debate that will be important to return to in the course of the activities that follow. Who was Sam Wanamaker? Why did he want to rebuild a Shakespearean theatre on Bankside? How long did the process take and what hurdles were encountered and overcome along the way? How similar is the new Globe to the original one (building methods, building materials, use of any modern technologies) and how much do we know for certain about the first Globe? Students are going to research Wanamaker and the building of the new Globe Theatre by interviewing 'Sam Wanamaker', who you are going to play. Support students in advance of the interview in their drafting of a variety of questions. The fact sheets on this website and books such as Barry Day’s This Wooden ‘O’: Shakespeare’s Globe Reborn are useful resources for the purposes of your research in preparation for this ‘teacher in role’ activity. Students can also access these fact sheets at home, via the Globe website. This is a term used to describe a production that explores methods used in Elizabethan or Jacobean theatre. Strictly speaking, the term Original Practices defines a particular approach used by the Globe when Mark Rylance was Artistic Director. Under Dominic’s direction the Globe is continuing to explore some of these techniques. Students could choose one of these areas and research it. This research could be used in a class discussion about the value of such practices 400 years later, when language, technology and cultural attitudes are very different. Macbeth has been staged several times at the new Globe since it opened in 1997, with the title role played by Jasper Britton (2001), James Garnon (spring 2010), Elliot Cowan (summer 2010) and Joseph Millson (2013). 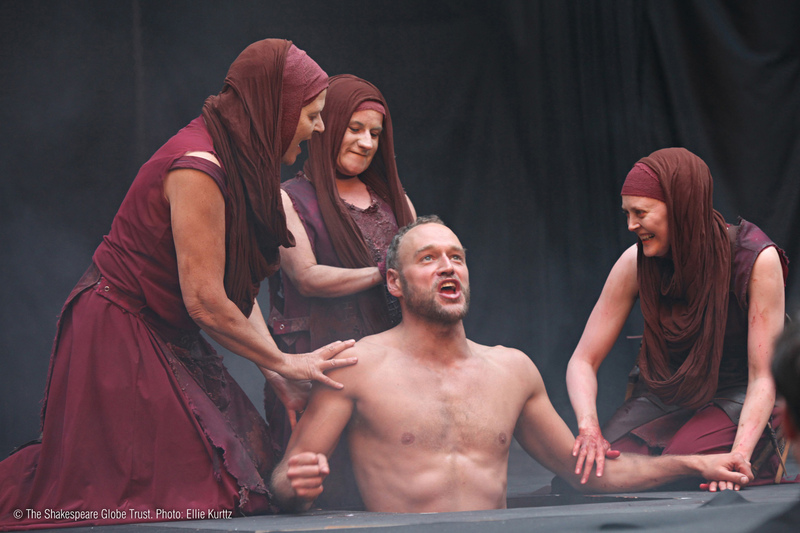 The Joseph Millson version is available on a Shakespeare’s Globe DVD, and extracts from the James Garnon version are featured throughout these materials, as are stills from all four productions. What can students find out about these different productions using production images, these resources, theatre reviews, the Adopt An Actor archive, etc.? Give students time to investigate this rich archive of actor interviews from past productions. Students could be given the name and headshot of a particular actor from one of the productions; they should then research that particular production, and how the actor prepared to play the character in question. N.B. There is a full cast list for all four productions in the Globe Education Shakespeare for GCSE Macbeth book, and in our Previous Productions archive. What was Sam Wanamaker’s vision in rebuilding the Globe? To what extent do I think this has been achieved? How can researching how Shakespeare was performed in the past be of use to actors today? Where would students prefer to see a production of Shakespeare? At the Globe or in a modern theatre? Outdoors? On screen? Why? What happened to the original Globe theatre? What steps have been taken in modern times to prevent history repeating itself? Students can read a factsheet about the new Globe here: shakespearesglobe.com/uploads/files/2015/04/reconstructed_globe.pdf. Ben Crystal writes in Shakespeare on Toast (pp.52-54) about the connection that can be achieved between the actors and the audience in the reconstructed Globe. Students could listen to the speech from Macbeth featured on this Original Pronunciation CD as part of their investigation into the language of that speech. Can I evaluate the importance of movement work and choreography in productions of Shakespeare? Can I analyse how different actors who have played Macbeth have communicated with the audience using body language, facial expression and other movements? Can I apply these insights to my own ideas for staging a very physical scene? Pick out quotations from the following interview with Kenneth Branagh, in which he describes stage fighting: telegraph.co.uk. Give these quotations to students and ask them which aspect of acting on stage they think Branagh is describing here. Explain after brief discussion that an actor was fighting with Sir Kenneth in a production of Macbeth, when he was hit with one of the real swords that are used for the battle scenes. The actor was checked over by on-site medics and continued with the performance, but after the curtain dropped he was taken to hospital to be checked over. How might the shape and layout of the Globe’s stage make particular demands of actors? In which parts of the play do fighting scenes take place that need carefully rehearsed movements? 1) What does a choreographer do? Students will find some interview questions and answers from a Globe choreographer at 2011.playingshakespeare.org/text-performance/choreography and from a Globe text and space coach at 2011.playingshakespeare.org/text-performance/text-work. Which other parts of Macbeth might require choreography? Ask students to consider how they would stage the final battle between Macbeth and Macduff in Act 5 Scenes 7 and 8. How naturalistic would the fighting be or would it be more stylised? Ask students to work in pairs, recording their ideas on a storyboard sheet in the Student Booklet. You could also ask students to bring some of these images to life in their own tableaux, and even take photographs to which captions/quotations could be added. How important are a character’s movements in a play? Should all movement on stage be planned and rehearsed? Why? How can a character’s movements affect our reactions to them? Ask students to find three stage directions from the play and to write some detailed notes about how that stage direction might be interpreted in the Student Booklet. This could be completed for homework. All performances of plays in Shakespeare’s time would have ended with a dance or ‘jig’ involving the whole company of actors. This is a tradition that continues to this day at Shakespeare’s Globe as you can see in the clip below, which also includes the fight between Macbeth and Macduff, Macbeth’s death and Malcolm’s restoration to the throne. What is the effect of a jig coming after these dramatic scenes? 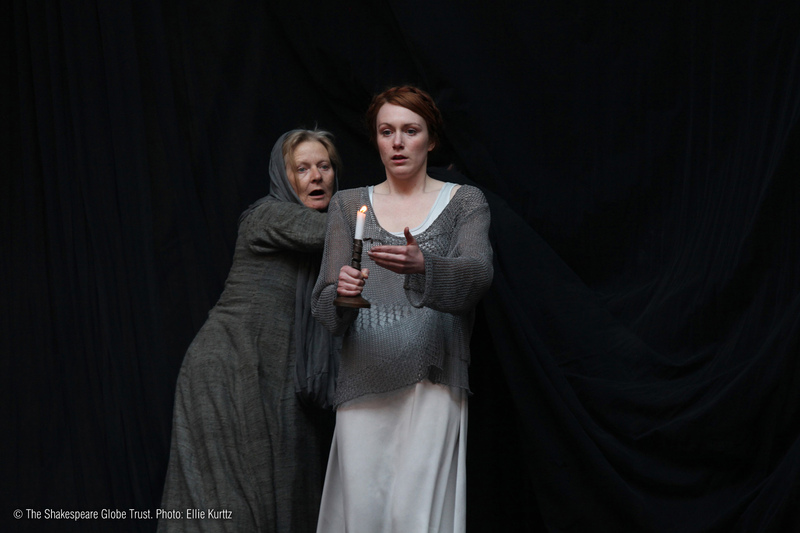 The learning sequences that follow – about performing the parts of Lady Macbeth, the Witches and the Porter – make several references to actors’ appearance and movement on stage. Can I find out about how different actors have approached the role of Lady Macbeth? Can I understand and empathise with the perspective of an actor approaching a role, and also those who support actors in approaching key scenes? Students could summarise some of their findings in the Student Booklet, adding some of their own ideas about playing Lady Macbeth too. What does a stage manager do? By following this link (2011.playingshakespeare.org/text-performance/stage-management), students can find out more about the stage manager’s role and about some of the terms they might use. In their notes and feedback, students should emphasise that the role of the stage manager involves a great deal of coordination of different artistic and technical inputs. If students have completed the previous task, they will have found out more about what a ‘prompt book’ is. For this activity, students are going to be creating a prompt book version of Act 5 Scene 1 in the Student Booklet. What different factors influence and inspire an actor’s performance in a role? What are some of the different ways in which Lady Macbeth has been interpreted by actors? How would I approach this role as an actor, a director or a stage manager? Create a spider diagram to show the different kinds of creative input that contribute to a performance. This could include: the actor, fellow actors, Shakespeare, audience members, musicians, costume designer, prop maker, choreographer, composer, etc. Lady Macbeth is an important noblewoman, but her role would have been domestic rather than political. The responsibilities of noblewomen like her would have included running the household and entertaining guests. Students could read and explore U. A. Fanthorpe’s poem inspired by the sleepwalking scene, ‘Waiting Gentlewoman’. The prompt book task could be used to assess reading, speaking and listening, particularly if students run through a rehearsal of the scene. Students could take on the following roles: the actors (Doctor, Waiting Gentlewoman, Lady Macbeth); the director; and members of the stage management team. This discussion should be as broad as possible to emphasise the cooperation and collaboration a play requires. Can I develop ideas about how the scenes featuring the witches could be staged? Can I support my ideas with textual evidence? Students should read the extract from David Bevington’s This Wide and Universal Theatre (2007), which is featured in the Student Booklet on the Playing the Witches page. Students should create a timeline, extracting key information about the spectacular effects used in various productions of Macbeth from the seventeenth, eighteenth and nineteenth centuries. What are Students’ views about some of the staging ideas described in this account? a) Ask students to read the following blog post by actor Paul Chahidi who played a Witch at the Globe in 2001. “We want the audience to have fun and really enjoy the scenes with the witches. The costumes for the witches are the same for the other characters, but we will now be wearing glasses with misted lenses. The scene will not be like the traditional witches’ scene as there will not be any burning cauldrons, we cannot dim the lights and the witches will not be reacting in the usual way. There will also be some salsa dancing! I think that the way we are staging this scene will have a great impact on the first appearance of the heroes Macbeth and Banquo. Is there anything that students find surprising about this account? b) Now ask students to listen to – or read transcripts of – a series of podcasts by actress Janet Fullerlove, who played one of the Witches in one of the 2010 Globe productions. This involves a considerable amount of reading/listening and students could work in groups, dividing the task between them before feeding back to each other. Students should make notes about each of the five podcasts, noticing any ways in which the actress’s ideas and decisions about playing the part changed and evolved over time. How do students imagine Act 4 Scene 1 and the apparitions in particular? If you were staging this scene, how might the stage, props, costume, music and sound effects be used in creative ways? Students are going to be the designer for this scene, imagining a range of ways to create powerful effects; these should affect both Macbeth and the audience. If there is time, students could develop some of their ideas in a presentation to the class that includes a performance of one short section of the scene and a commentary on the decisions they made about staging it. How would you make the witches’ scenes both spectacular and also thought-provoking on a deeper level? How would you want the audience to interpret the witches in your production? Students could give feedback to each other following their presentations. In Act 4 Scene 1, Shakespeare makes use of the trapdoor through which actors or props (such as a cauldron) could appear. There is an short essay about the witches at 2011.playingshakespeare.org/themes-and-issues/the-witches on the Playing Shakespeare with Deutsche Bank microsite. Witches were popular on stage at the time Macbeth was written. They appear in several plays of the era, such as Thomas Middleton’s The Witch in which Hecate’s song also appears. There are further Key Stage 4 materials about the witches’ language and about attitudes to witchcraft in Shakespeare’s time which can be found in Historical and Social Contexts. Can I comment on the significance of the Porter scene in the play as a whole? Show images of the Porter from different productions. The pictures should demonstrate that the Porter can be played a variety of ways, for example, as a young or old man (or woman). You should emphasise that there is scope both for comedy on stage (staggering around, peeing, being sick), and for creating quite chilling effects, since the Porter jokes about being the porter to the gates of hell. Students could then listen to David Tennant’s audio version of the beginning of this scene (youtube.com/watch?v=Yr4jULsh9Lg), as they read Act 2 Scene 3 lines 1-40. Students could make notes on how Tennant makes the scene funny and also brings out its darker elements. Ben Crystal writes that ‘Some of the jokes have a 400-year-old sociological reference underpinning them, so are not easy to understand’. Ask students to speculate about how this scene can be made to seem relevant and funny for a 21st century audience. 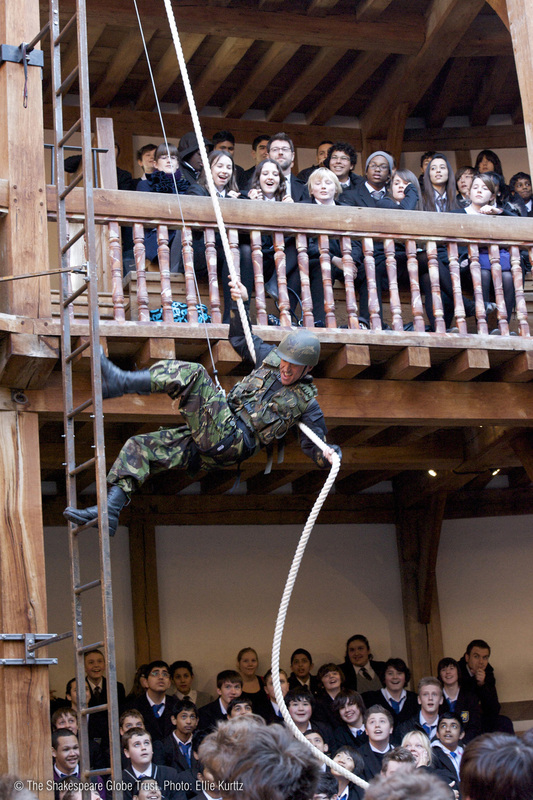 Show students the 2010 Globe version of the beginning of this scene below, featuring the actor Russell Layton playing the Porter. As with the Tennant version, students should listen and make notes about what is funny about the way the scene is staged and acted; this time, they should take account of visual effects – costume, props, body language, etc. They should also think about how the darker and more dramatic aspects of the scene are dealt with in this version. Q) What has been added to the scene? Q) Why do you think this material been added? Q) What is your personal view about the effectiveness of these changes? The Romantic poet and critic Coleridge argued that, 'This low soliloquy of the Porter, and his few speeches afterwards, I believe to have been written for the mob by some other hand'. In his book Shakespeare's Language, the critic Frank Kermode describes the Porter scene as 'the hinge of the play', arguing that 'the knocking connects the scenes, connects what went before with what comes after Duncan’s death'. Students could work in fours, with one pair taking Coleridge’s view and the other pair taking Kermode’s view. Each pair should write a few sentences and provide some evidence to support the view they are taking. After hearing both sides, the group should then discuss their own views in light of the points and evidence given. What is the importance of this scene both practically and in terms of the ideas and themes of the play? Ask students to imagine they are involved in staging this scene (either as actor or as director). To what extent would they try to bring out the comedy of the scene and how would they do this? To what extent would they bring out the darker and more serious themes of the play in this scene and how would they do this? Students could work in pairs and present their ideas in the form of a dialogue between actor and director. ‘Knock, knock, knock. Who’s there, i’th’ name of Belzebub?’ There is a popular theory that ‘knock knock’ jokes have their origins in this very scene. Students could improvise some topical knock knock jokes about different professions of modern times. Students could find out more about Will Kemp and Robert Armin, the actors who played many of the comic parts in Shakespeare’s plays when they were first staged. Not only does the Porter refer to himself as ‘devil-porter’, but Macbeth’s servant’s name ‘Seyton’ sounds exactly like the word ‘Satan’. What might the significance of this be? Students could research other portrayals of the Porter on stage or screen and/or other critical viewpoints on the significance of this scene as a homework task. What are some of the different possibilities when producing Macbeth on stage and on screen? How varied are the interpretations of Macbeth by different directors that I have researched? Distribute sets of cards, some with short descriptions of some famous screen versions of Macbeth and some with stills from those productions. Examples could include Akira Kurosawa’s Throne of Blood (1957), Roman Polanski’s Macbeth (1971), or Macbeth with Michael Fassbender (2015). Students should match the still to the film it is taken from. Take feedback, ensuring students explain how they worked out their answers. Through class discussion, build two brainstorms showing some of the different possibilities of stage and of screen when performing a Shakespeare play. Together students build up a gallery of images and an archive of research about different productions of Macbeth on stage and screen, including reviews of those different productions. Different pairs or small groups could research particular productions and become ‘experts’ on that particular production. Allocate productions to ensure that across the class, a mixture of stage and screen versions are researched. Students could collaborate to produce a timeline of productions as a class display. Individually, students choose one element of the play, either a character or a particular scene. They should prepare a slideshow presentation, comparing and evaluating different interpretations, and expressing some personal opinions and preferences. In order to acquire their evidence, they should consult their classmates who are by now experts on various productions. Students should make as many connections as they can to the text itself, and to how it has been interpreted in the various versions of the play they are examining. As listeners, students could make notes about words and phrases that their fellow students have used to compare and contrast different versions; these words and phrases could then be collected in a word and phrase bank. 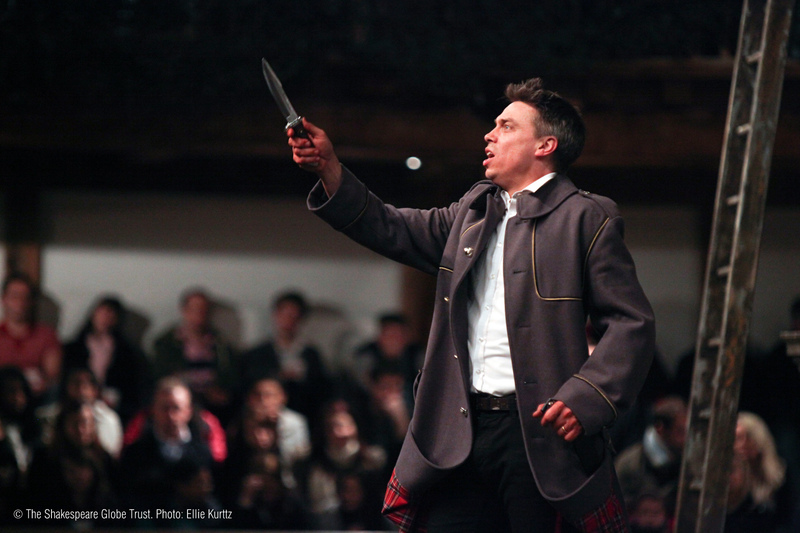 How has Shakespeare’s Macbeth been interpreted in different ways on stage and on screen? What is my personal response to some of these different portrayals and interpretations? Can there be such a thing as a definitive version? Students construct a complex sentence comparing one particular aspect of two different productions using some of the language from the word and phrase bank. The BFI has produced materials about Film Language in general and about a number of examples of Shakespeare on film, including Olivier’s 1944 Henry V and the 2010 version of Othello starring Christopher Eccleston as Iago. As extension work, students could bring in research about other productions they have studied independently. The individual presentations can be assessed for speaking, listening and reading. Can I demonstrate awareness and understanding of Macbeth as a text written for the theatre in my essays? Can I write about the dramatic effects of Shakespeare’s text on stage in an insightful way? The man who is being Macbeth in this story talks on his own about how he is thinking and feeling about killing the king in the next part. One or two pairs could share with the group the improvements they made and why. What is the effect on the reader of clear, precise and appropriate vocabulary choices? As a class, students compile a detailed glossary of drama and theatre terms and include this in the Student Booklet. Students might be asked to write about Macbeth in performance in more than one way, e.g. Students could identify the Text type, Audience, Purpose and appropriate level of Formality for these different kinds of tasks. Write a review of a production of Macbeth you have seen. Explain to a group of actors, designers, etc. your vision as director for a new production of Macbeth, aimed at attracting more teenagers to watch Shakespeare plays. What advice would you give to the actor playing Lady Macbeth in Act 5 Scene 1? Make reference to at least two other parts of the play within your answer. Re-read Act IV Scene 1 lines 37-115. Describe in detail how you would stage this part of the scene and explain the reasons behind your decisions. Compare how the character of Macbeth is portrayed in three different stage or screen versions of the play. Ensure you refer extensively to the text in your answer. To what extent would you agree with the literary critic Frank Kermode that the Porter scene is 'the hinge of the play'? How can I demonstrate my understanding of Macbeth as a work of drama to be performed? To what extent should I write about performing the text when I'm writing about characters, language or themes for an essay? Focus marking of work in progress against individual curricular targets. The tasks in the question banks can be used as the basis for devising further tasks to suit the needs of your own class, curriculum and syllabus. For more detailed guidance for students on revising and writing about Macbeth in exam conditions, see the materials in the Student Booklet.